Don't let your room hold your sound system back! The results are a reduced soundstage, balance problems, and a build-up of bass frequencies. 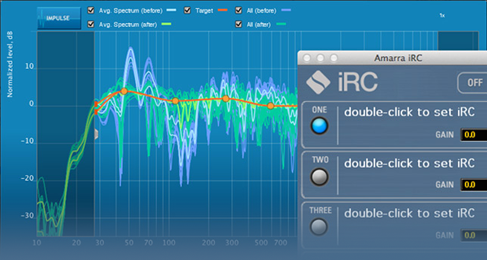 iRC Impluse Response Correction, based on advanced technology by Dirac, brings these under control. The result is a more focused soundstage with improved phase coherence, bringing more realism and natural sound to your music. The iRC Measure application uses a calibration microphone (not included) to analyze your room, build an acoustic model to detect defects, and automatically create filters. 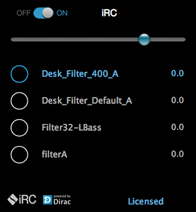 Take control of your domain with iRC (Impulse Response Correction), a cost-effective and more flexible alternative to unsightly baffles, diffusers and other room treatments. Now available in Amarra 4 Luxe and Amarra sQ+. "iRC rocks! It clears out room idiosyncrasies and brings out the hi-fi!!" "With Impluse Response Correction the musical image has just widened massively, with a much tighter audio performance..."
"...simply masterful — this is the best that my 2-channel system has ever sounded!"